Winter began yesterday, and with that in mind today's post is all about coats! 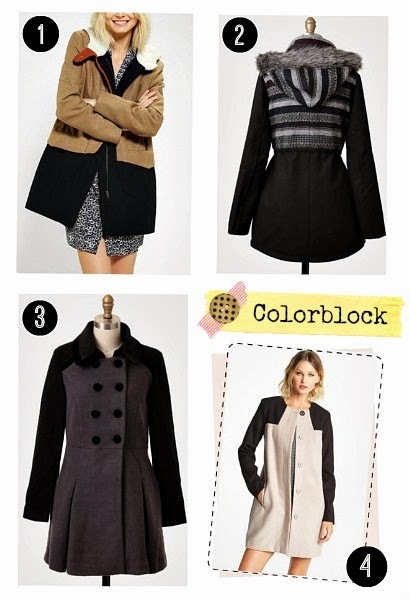 Colorblock coats that is! You might not have even noticed, but this fashion trend is creeping up on us again. When I first discovered this I wasn't all too excited...but the new coat designs have really changed my mind. Instead of being bright and bold they are a lot more subdued, which is great for winter! With Post-Christmas sales already happening (I can't believe it either...) you can get these coats at pretty affordable prices too! *NOTE*: Some of these items will sell out fast because of the holiday season. I recommend shopping in store if this is the case. For coats by Ruche, the retailer has a "notify on restock" button next to the sizes available. 1) Members Only Homecoming Wool Coat // Urban Outfitters $169 - The colors and collar make this jacket too good to pass up. Great for walking around campus. 2) BB Dakota Isolde Hooded Coat // Ruche $79.99 - This jacket is not entirely colorblock, but it was too cute to not include! The faux fur and fair isle make it very cozy and down to earth. Like you just came inside from a snowfight with your boyfriend. 3) Sugarhill Pheobe Double Breasted Coat // Ruche $123.99 - For some reason this coat screams Audrey Hepburn to me. The bold buttons and a-line bottom makes it perfect for a date night or dinner party with the girls! 4) BB Dakota Collarless Coat // Nordstrom $58.98 (Also here for a higher price) - Very clean and sophisticated, this coat is perfect for wearing to work or any important events. I love how only the top button is black! !